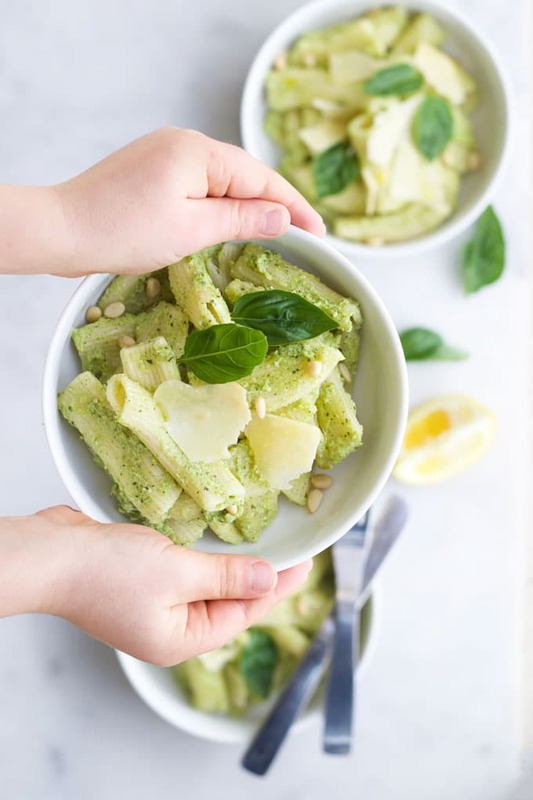 If you are looking for a fast, fresh and flavourful meal then this Broccoli Pesto with homemade pasta ticks all the boxes. Disclosure: I have been compensated for my time spent on this post from Philips, but as always my thoughts and opinions are honest and are my own. I am often asked how I manage to get my boys to eat so well. Although I think there are many reasons behind their adventurous pallets, I do believe that one of the main driving factors is that I try to get them involved in all aspects of their meals. They help with meal planning, buying produce and cooking. Although I love cooking with the boys, it does take time and patience. This is all very good at the weekend but on busy weeknights, when the boys are tired and hungry, it isn’t always the most relaxing of experiences. Making fresh pasta would certainly not have been something I would have attempted on a weeknight. That was until Philips sent me their Pasta Noodle Maker. 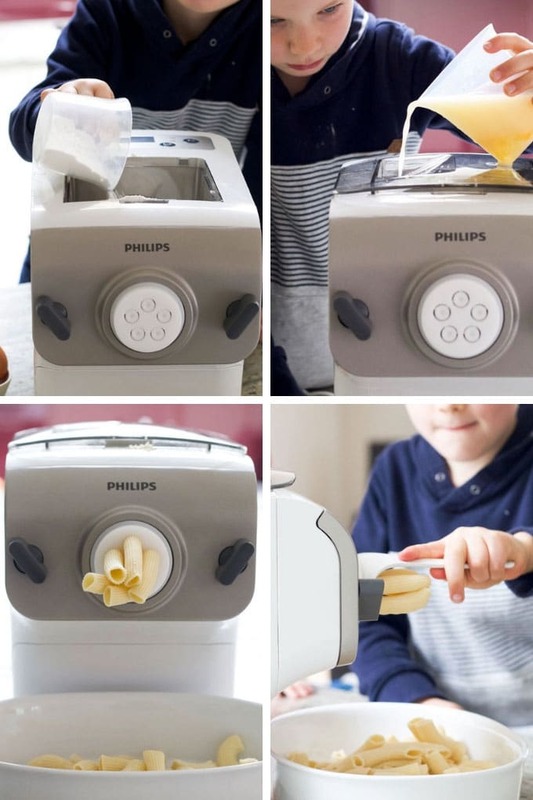 Everything about the Philips Pasta Noodle Maker is easy. From the weighing out of ingredients to the cleaning up of the machine. Finn, my seven-year-old, can now prepare fresh pasta, for four, with very little help and in less than 15 mins. The Pasta Noodle Maker comes with four different discs that make noodles/spaghetti, linguini, penne and lasagne. You can also buy additional discs including rigatoni (as pictured). The sky is the limit with shapes and flavours. The great thing about fresh pasta is that it takes very little time to cook. The cook time will depend on your pasta thickness/shape and your preference. In general, it usually takes somewhere between 90 seconds to 4 mins to be ready. 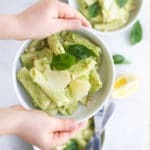 Fresh pasta is more likely to stick together than dry so if you haven’t cooked fresh pasta before here are some tips that I find work well. Use a large pan that is full of salted water. You want to give the pasta enough room to move. Let the water come to a rapid boil before gently adding the pasta. Once you have added the pasta the water temperature will drop. Stir the pasta and then cover to bring it back to a boil quickly. Once boiling again, remove the lid. The only way to know if your pasta is done is to taste it. Check after around a minute of cooking, it should be al dente, or firm to the bite. Remember it will continue to cook in a sauce. 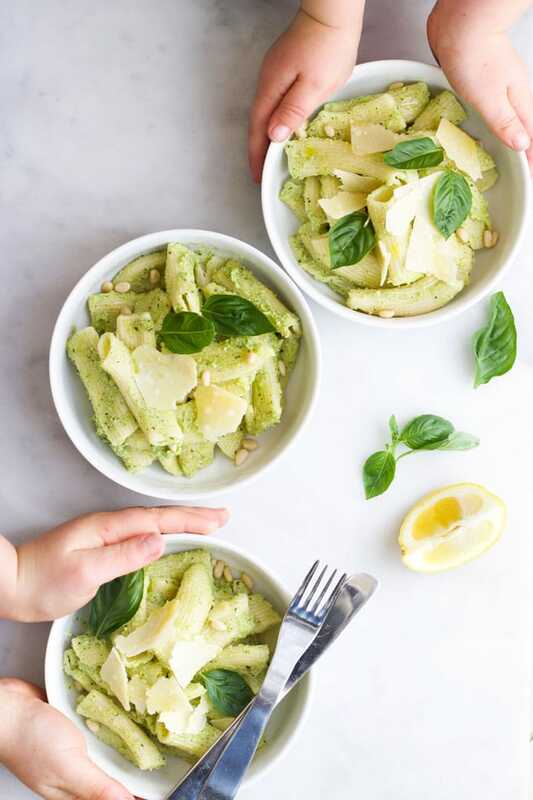 I’ve paired the pasta with an, equally easy to make, Broccoli Pesto sauce. I love to make different varieties of pestos, experimenting with adding different vegetables. It is a great way to get kids eating a little more veg without them really even noticing. When making the Broccoli Pesto, taste and adjust the ratios of the ingredients to suit. I find a little bit of salt really enhances the flavour of this pesto. If you are making for babies / young toddlers, and are worried about the sodium level, then remove their portion and then season the rest to taste. Have you tried this recipe? I love to hear your feedback. Please rate and leave a comment below or tag me on Instagram. 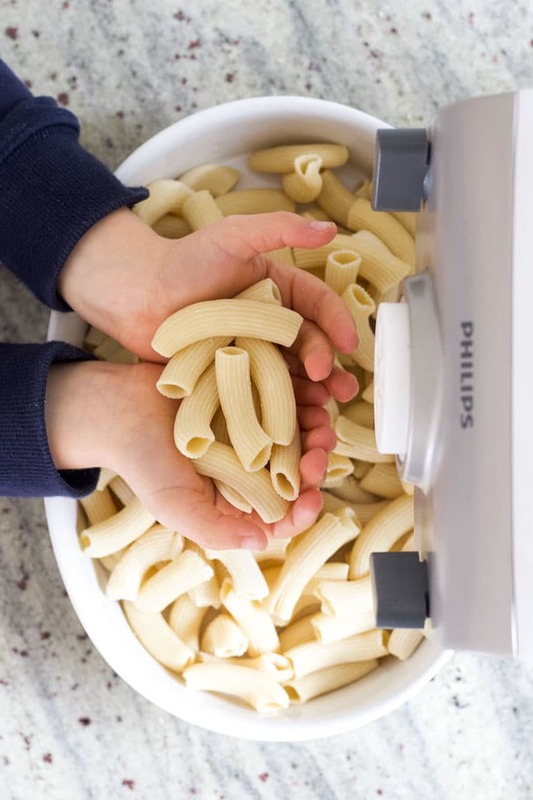 To prepare the pasta, place flour in the mixing compartment of the Philips Pasta And Noodle Maker. Turn the pasta maker on and select the 500g program and press start. Slowly add the egg and water mixture through the liquid feeder. Once the pasta is extruding, cut to the desired length using the cutting tool. To make the broccoli pesto, steam the broccoli until it is tender. Add to a food processor along with the remaining pesto ingredients. Blend until smooth. To cook the pasta, bring a large pan of water to the boil. Add the pasta, place a lid on and return to the boil. Remove lid, reduce to a simmer and cook for approximately 90 seconds-4 minutes. Drain the hot water, reserving a cup. Return drained pasta to the pan and add the pesto, stir through adding a little of the pasta water to thin out the sauce.